It’s time to start decorating for the holidays, and this pretty little Christmas tree would be a great addition to your holiday decorations! 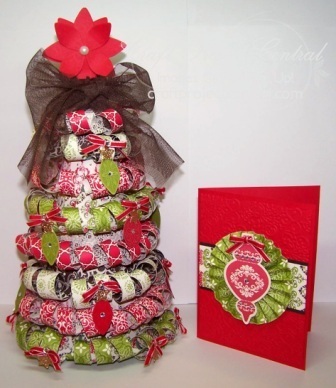 The tree is made with Designer Series Paper and decorated with little ornaments made using the Ornament Keepsakes stamp set. Make one as a gift and, make another one to keep for yourself! There’s also a coordinating card to go with the tree if you’re making it as a gift. This pretty project was made by Christy Fulk, and you can get the details on her tutorial over at Craft Project Central. Almost Time for Giving Thanks! Same Card - Two Occasions! Versatile Snow Festival Designer Printed Tags!